How we survived against all odds! KENYAN Kibet Alex won the men’s category of the 2018 10 kilometers Okpekpe road race yesterday in 29.46 seconds after the participants defied the heavy downpour to participate in the annual sports event. 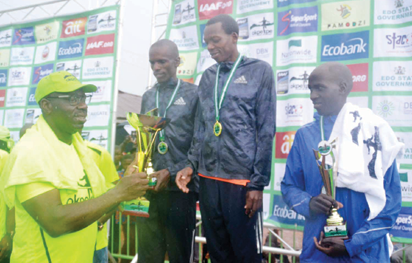 Edo State Governor, Godwin Obaseki presents awards to the winners of Okpekpe race, Kenyans Kubeta Alex, Simo Cheprat and Ronoh Timothy. The rain began ten minutes after the VIPs race flagged off. Among dignitaries in the VIPs were immediate past Governor Adams Oshiomhole, Governor Godwin Obaseki, Minister of Sports, Solomon Dalung, Edo Deputy Governor, Philip Shaibu, Edo First Lady, Mrs. Betsy Obaseki, former Commissioner for Environment, Mr. Clem Agba, amongst others. Foreign athletes including their Nigeria counterparts had earlier began their race 20 minutes before the rain began. Governor Obaseki and Oshiomhole completed the race despite the rain. It was a day of glory for athletes from Kenya as they won in the male categories while an Ethiopian, Yani Dera Dida won the female category, leaving the second and third for the Kenyans. Alex ran 29.46 seconds to win the male category, Simon Chepat was second in 30.29 seconds while Ronoh Timothy placed third by finishing in 30.39seconds. The other female winners from Kenya who placed second and third were Tuei Sandra Chebey and Kipyokei Diana. Speaking to newsmen, Kibet said the weather affected his time. “I want to thank God for winning this race. This is my first time to be here. The course was not easy especially the finishing point. The starting point was okay but the finishing point was hilly.